Here's the thing about being a published writer: to some degree, you're putting yourself in the public spotlight. What you do with that spotlight, however small and faint, is up to you. You don't have to do anything, mind you. You can just write books and let that, in and of itself, represent you. Suzanne Collins is a relatively private person, not going to cons or doing blog tours, and The Hunger Games is hardly suffering for it. On the other hand, if you've got a spotlight, no matter how small and faint, you may decide you have things you want to say, be them political or personal. And, to a degree, if you've got a public identity you want to carve, then do your damn best at carving it. Because sometimes, if you don't define your public persona, someone else is going to try to define it for you. And if that person's voice is loud enough, then what they have to say about you becomes who you are, as far as the public is concerned. Now, if you do carve that public identity, then you also have to manage it. In the current highly charged political atmosphere, I've noticed that tends to mean playing to one's base. I've seen more than one writer (on all points of the continuum) who end up gravitating to the fringes, throwing more and more red meat at their base. Failure to throw said meat can then result in their base turning on them. I've seen plenty of fans-- extremists, to be sure-- declare that they were done with a writer due to a lack of ideological purity. But, again, don't feel like you need to do that. You don't have to have a platform, political or otherwise. I certainly don't, because it just looks exhausting. So, as far as my public person goes, I make blog posts about writing craft and process, worldbuilding, and whatever else crosses my mind. I go to the cons I can, try to sound charming and intelligent, and wear vests that look dashing. And hey, speaking of, I'll be at ComicPalooza in Houston for Memorial Day Weekend. I will be wearing dashing vests. Come on over and say hello. When I was a kid, one of the cliched things we were told about Native Americans was how they used "every part of the buffalo". Now, this is a perfectly true statement, but it was presented with a sense of astounded wonder, that it was a unique cultural trait. It certainly seems almost unbelievable to us in the here and now, where the process of animal-to-meat or grain-to-bread is largely invisible to most of us. But the truth is that maximizing the use of animals, plants and other resources is a common trait for any pre-industrial society. What they use and how they use it can be a defining part of worldbuilding. Now, I've talked about domesticated animals and fertile centers of origin, which are crucial things to consider when building cultures from the ground up. But there's more to that then just listing the available crops and animals. 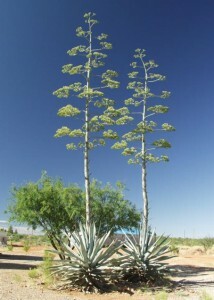 Take for example, the agave plant, cultivated in pre-Columbian Mexico and American Southwest. It was a source of food, fiber for cloth, a fermented beverage (pulque), and is now the source of tequila. The spiny tips of the leaves could be used as weapons or ornament. The woody central stalk could be used for instruments, tools, Its use was the focal point of ceremony, its preparation a defining point of culture. 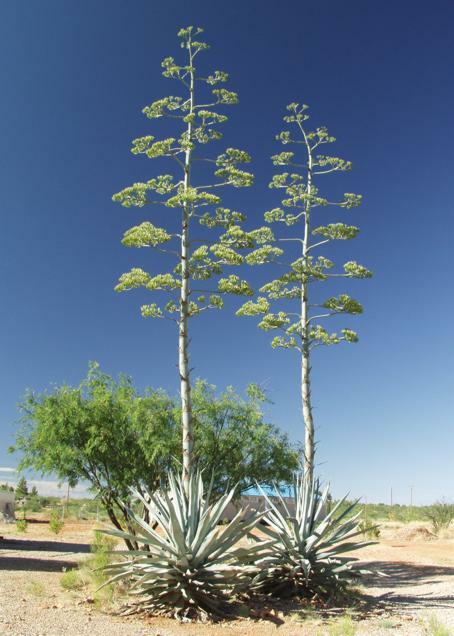 Moving away from the agave specifically, consider howyou can use the process of cultivating, harvesting and preparing a central crop in defining the culture. Is the plant sacred? Is the use religious? Are only certain people allowed certain uses? Who, and why? The same can be applied to animals. What does the animal mean to the culture? Now, this is where research is crucial. If a resource is crucial to a culture, you should understand what all the potential uses are. Does that mean you need to know how to go from seed to finished product? Not necessarily, but having that knowledge wouldn't hurt. Especially since that knowledge can further define how a culture operates from day to day. If, like in the case of the agave, the crop must be roasted to transform the sap from a poison to an edible sugar, then method of roasting itself can help define a culture. Let's talk a bit about the 2003 Daredevil movie and the Daredevil Netflix series that just came out. The former was largely panned, and is considered one of the low points of the dipping-our-toe-in-this-superhero-thing movies of the early-aughts. The latter is yet another layer on the every-growing current Marvel Cinematic Universe that consists of a dozen films and two other TV series, with several more of both announced for the coming years, and has been widely lauded. Now, what were the key differences between these two depictions of, fundamentally, the same character? Why did one work, and the other failed? I would argue a key reason would be Suspension of Disbelief. The recent iteration, despite existing in a world in which alien invasions, flying men in powered suits and green gamma-ray monsters are an accepted fact of life, maintains a certain degree of real-world believability. Matt Murdock is blind, but his other senses are superhuman, and he's trained himself to use those senses as a highly skilled street fighter. But he's still just a man, and he gets seriously injured along the way over the course of his battles. His skill, his senses and his outright fearlessness allow him to jump up fences and walls, leap from building to building, in ways that would make most parkour enthusiasts' collective jaws drop. But he never transcends "that's amazing" levels of skill. He doesn't do anything that you can't believe a man with sufficient skill and commitment couldn't also do. In writing, of course, you have to find that same level of believability, even in a setting where the incredible and fantastic can occur. I struggled with this in early drafts of The Thorn of Dentonhill, where I had Veranix take quite a few heavy beatings and be more or less fine the next day. And I know part of that was going by the Cinematic Flesh Wound Rule**, but my editor called me on that. Unless there's magic healing***, you need to let your characters heal or suffer the consequences. And injuries should have long term consequences if they are bad enough. Thus one of Veranix's injuries went from an arrow straight through his leg to a deep gash from a shot that grazed him. I wanted him hurt, not never walking right again. So: what do you do to balance the believability of your fantastic things? *- There are actually a host of other reasons why the Daredevil movie didn't work, but this is a big one. Or at least, a symptom of the larger problems. **- Best illustrated in Last Action Hero, where when Jack Slater is in the "real world" and gets shot, he's on death's door with severe trauma, but once he's brought back into his movie, he can shrug it off. ***- Something which JK Rowling used well, in that magic healing could do a lot, which let her really do horrible things to her characters. Like have Harry's arm-bones be accidentally removed. But it was OK, because a spoonful of Skele-Grow is all it takes to deal with that problem. ****- Also known as the Barry Allen Isn't Too Bright Rule. Because 90% of his cases can be solved by "grab bad guy and put him in my ethically questionable super-prison before he knows what happened". In the midst of all the other things I've got going on, the ArmadilloCon Writers Workshop is quickly coming upon us. After three years in the co-pilot seat, I'm taking charge! And now that I'm in charge, I'm going to... pretty much run it the same way. Because it's a well-designed Writers' Workshop why mess with something that works? Here's why I love this workshop: it's one that just about anyone who wants to improve their writing can do without too much hardship. I mean, Odyssey and Clarion are great, but you've got to be able to spare six weeks and a few thousand dollars to be able to go to them. I know I wouldn't have been able to do that. ArmadilloCon Writers' Workshop is a one-day workshop, and for the $79.50 fee you also get a full membership to the con that weekend and lunch included. Which is a pretty good deal, considering you'll also get your manuscript (short story or novel sample, up to 5000 words) critiqued by writing professionals. And who are this years writing professionals? Here are some of the ones who'll be there this year: Ken Liu, author of what's quickly becoming the most talked about book this year, The Grace of Kings; L. Timmel Duchamp, editor of Aqueduct Press; Stina Leicht, author of Of Blood And Honey, Blue Skies from Pain and this year's Cold Iron; James Morrow, author of Galapagos Regained and many more novels; also Skyler White, Steven Brust, Kathy Catmull, Rebecca Schwartz, Martin Wagner, Derek Johnson and myself, of course. That's a lot of value for $79.50, frankly. So, registration for the workshop is here. Deadline for registration and submission is JUNE 15th. The workshop is on JULY 24th, and all of ArmadilloCon runs July 24th-26th. One of the things I love about Game of Thrones is how it uses a wide reach of locations-- both in story and in the filming. They shoot the show in Croatia, Ireland, Iceland, Morocco, and I don't even know where else. One of the great things Martin has done in the books-- and it translates onto the show-- is paint a large canvas of different places and different environments, and letting those environments define the character of that part of the story. Now, if you're going to do this well, you need to do some research into biomes. Now, there are several different definitions for the different types of biomes, different systems to define said biomes. Most of these involve looking at the factors of temperature, moisture and elevation. I'm partial to the definitions in my handy Biome Key, pictured here, and based off the World Wide Fund for Nature's system. Figuring out what biome your story is set in will define the character of your story. Food, clothing and attitude of your people will all be drawn from the biome of their environment. 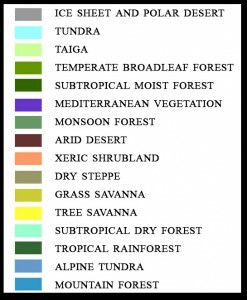 Now, some of these distinctions may seem trivial-- how different is a Xeric Shrubland from an Arid Desert or a Subtropical Dry Forest? But having a strong understanding of exactly what the environment is like builds the verisimilitude of your worldbuilding. And with that, of course, is the flora and fauna. Beyond the domesticated and edible ones, you have to think about how each of those exists in the environment. If you're building something fantastical or science-fictional, give some consideration to the whole ecology. How do the different creatures survive their environment, especially if it's harsh? What do they eat? What does what they eat eat? How does what they eat avoid getting eaten long enough to maintain a balance. You don't want, say, an area filled with alpha predators and very little prey. What biomes are you writing in, and how are you distinguishing it as a unique place for your story? Some time ago, I read a work-in-progress for critique which had some interesting problems with passage of time. It would spend a few chapters focusing on the minutiae of a couple days, and then skim a few years, and then drop in on a random day or two over the course of those skimmed years. However, those drop-in days were not particularly revelatory or relevant. The end result was making those passing years feel like a slog. Now, sometimes years have to pass in the story. You set some stuff up in a character's youth, and then jump ahead to when those pay off. But sometimes it's best to just skip those years cleanly, and assume your reader is smart enough to catch up. Personally, I tend to write relatively fast paced. The Thorn of Dentonhill's story covers about four days' worth of time. 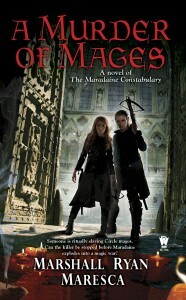 A Murder of Mages is three days. The sequels to both, currently in draft stage, also cover about three or four days. For me, this is a way to keep the springs coiled tight. There's little chance to breathe and regroup. Now, with the draft of Banshee, I built into the worldbuilding a bit of a challenge, as far as this goes. Specifically, the way the FTL travel works, going from one star to another may be blazing fast in interstellar terms, but still take a bit of time. The two weeks of routine as the ship goes from Point A to Point B isn't particularly dramatically interesting, but it needs to be addressed. For me, moments like that are best done with the literary equivalent of a montage. Establish that routine with quick description, and move on to the ripe circumstances. If it doesn't drive forward, cut it out. Of course, the question is if what I'm doing on Banshee works. Time will tell. I don't typical make any sort of "political" posts on my blog. Not because I don't have political opinions; of course I do. But I find that, usually, when an issue comes up that pushes my buttons, someone else has already said what I would say, and says it better than I would. So there's rarely a need for me to through my two cents in as well. And that is probably the case with this year's Hugo nominations. Short version for those of you not in the know: In previous years a group of conservative-minded SF Writers, feeling their voices were being marginalized in the Hugos, organized a united slate called "Sad Puppies". Last year they succeeded in getting a few things on the ballot. Good for them there; though in the final tally they did poorly, they got some work that might otherwise have been ignored some notice. Frankly, I think that's how any sort of voted-by-membership award should go. This year, though, instead of "a few things on the ballot", they and their more destructive-minded counterpart "Rabid Puppies", utterly dominated the nominations. There are only a handful of nominations across the board that are not part of their slate. This is all allowed by the rules of how it works, mind you. They didn't cheat. They may have Min/Maxed and Rules Lawyered their way to a result that only a Chaotic Neutral would call a "victory", but nonetheless, their campaign "worked". And here I thought it was tacky to give myself a five-star on Goodreads. But there's a somewhat disturbing sense of "we're the real SF, not you" coming from both sides of the aisles. Which I find disappointing. True, there are people-- again, on both sides of this thing-- who have said things I personally find extremely odious. I don't like them as people. Some of them may not like me. ** But they have as much right to their opinion of what is or is not good SF. *** "We" do not own SF over "you", whoever you or we happen to be. None of us are Fake Geek Girls. All that said, I have every intention of reading the nominees and voting fairly, though I am prepared to engage in liberal***** use of "No Award" where I find it justified. And despite finding the nominations.... odd and troubling, to say the least, there are some bright spots. Sheila Gilbert received her third consecutive nomination for Best Editor, Long Form. 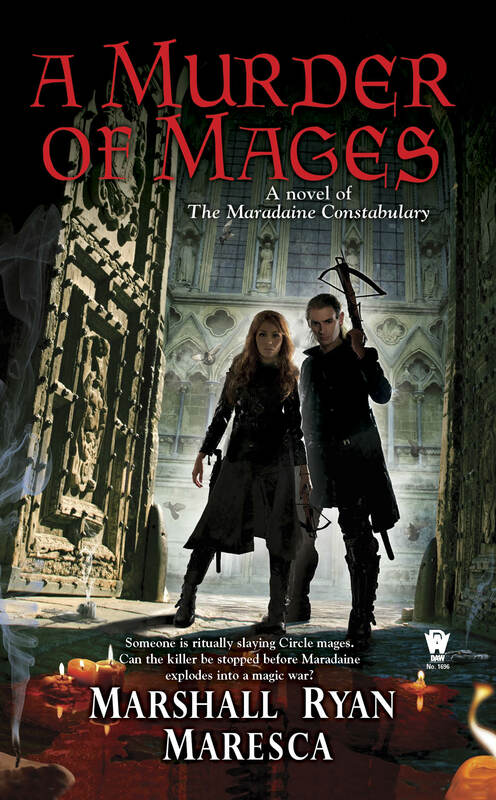 As she is my editor, and made the choice to publish Thorn of Dentonhill and A Murder of Mages, I strongly endorse her nomination. Wesley Chu received the Campbell nod for the second time-- the only one of this year's Campbell nominees not on the SP/RP slate. Wes is a great guy and a great writer, so this is excellent. This year's Dramatic Presentation, Short Form nominee list is the first in ten years not to be overwhelmed by Doctor Who episodes. Don't get me wrong, I love Doctor Who, but in 8 of the 10 last years, it took three out of five slots, and those other two in merely took two. For only one Doctor Who episode to be nominated-- combined with the nomination of the Flash pilot-- is a bit of fresh air in this particular category. *- Are there any? I don't know. **- More likely they are utterly unaware of my existence. ***- Though I find it fascinating that a key argument the SP Advocates make is that the award had gotten too frou-frou literary instead of "fun"-- an argument made the same year Redshirts, about as non-frou-frou fun**** as a book can be, won the Best Novel award. ****- Full disclosure: I loved it and voted for it for best novel. I've talked several times in the past that my real gateway into "traditional" fantasy was David Eddings. One of the complaints laid against him, which is a pretty fair complaint, is that all his characters talk with the same voice, have the same sense of humor. Certainly this phenomenon increases as you go later in his career. Books like Regina's Song or The Redemption of Althalus have a core group of six or so characters who are all, more or less, the same person talking to themselves. How do you avoid falling into this trap? How do you give each character a distinctive voice? Part of how I deal with that is going back to my playwriting and acting roots. Every character in the scene is going to have a different motivation, a different interpretation of what was going on. I had to approach writing each character as if a different actor was going to tackle each one. Now, I'm never one for selecting a specific actor for a character. Well, that's not entirely true. Part of my early process involves coming through headshots to find faces that match the one in my head, give myself a reference. Never a "famous" actor. I wouldn't want to let that infiltrate my process. Keeping those things in mind keeps the interplay between the characters from being just an echo chamber of my voice bouncing around the room. How about you? How do you keep your voices distinctive?